AHHH! That was me after getting approved to read Ashen Winter on Netgalley. 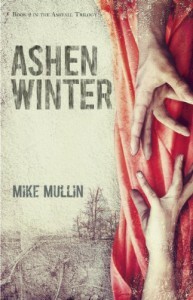 Last fall, I read and fell in love with Mike Mullin's first novel, Ashfall. I adored him AND his novel! I couldn't wait for this one to come out and I was hoping and praying that I would be approved to read it. I was NOT disappointed! It was just as good if not better then the first one. Well, when I say this novel started off with a bang...I mean it. Literally. There's no shortage of action in this novel and I LOVE that. Alex and Darla seem to be drawn to danger and even though they faced plenty of it in Ashfall, the things they encounter in Ashen Winter are just as bad. I really enjoyed watching the progression of Alex's personality through Ashfall and I loved that Mullin continued his growth yet solidified his character throughout Ashen Winter. I think one of things that impressed me the most was that Alex's TRUE nature, beliefs and values stay in tact. He does what he has to get to his parents, to Darla and to escape but he still genuinely believes in right versus wrong. The passage when he confronts his father about some things made me feel incredibly proud of Alex. He stood up like a real man, who believed in the darkest hour, a man should stand for something. The horrors are plentiful in this novel, which of course I LOVE! Mullin doesn't shy away from the gory and often times horrifying situations that actually COULD happen if a volcano erupted. He so accurately makes a statement (whether or not it was intentional, I don't know) about government choices and disasters. The government is as corrupt as the cannibals in this novel and I totally think that could happen in real life. People in power when the rest of the world is in turmoil is NOT a good combo. I think Darla and Alex's relationship with each other is perfectly portrayed. They have a mature relationship due to the nature of their lives post supervalcano and yet they still have the playful and naive teenage aspect. Hormones are still raging, that doesn't quit even when a natural disaster strikes! I love that the pace is quick and continually in motion. I read this book very quickly and would have finished it in one night if it hadn't of been for my day job! I also enjoyed the new characters that joined the gang as well as the old. Rita Mae-the librarian from book one is back and she is AWESOME! 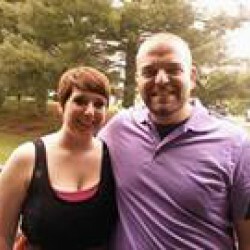 We also have Alyssa and Ben who are new to us, but I have a feeling they'll become more important in the next book. Ben has Autism and he is a source of great comic relief in the novel. Mullin did a great job of his portrayal without going overboard. We got enough information to deduce that he mostly like had Autism, but the confirmation was nice too. The cliff hanger at the end made me scream of course. I already can't wait for the next book. I'm so happy to say that knowing Mike Mullins personally made my enjoyment of these novels so much better. He's truly an inspiration and I'm glad that his writing dreams are coming true! Overall, I really ENJOYED this novel and I think it's actually even better then the first. Lots of action, lots of attachments to characters. This is a great roller coaster ride! I give it an A!